Indigenous Peoples have their own traditions of legal order. (You can learn more about Indigenous legal traditions in our section on Indigenous Peoples, Canada, and Property and by clicking on the link below to Val Napolean's study, "Thinking about Indigenous Legal Orders") There are different understandings of fundamental legal concepts like property, evidence, and community forms of justice. Indigenous legal practices include traditions of story telling and the use of wampum belts in some cases. It is therefore not surprising that friction exists where Indigenous legal traditions and practices intersect with the common law and civil law traditions. Val Napolean, "Thinking About Indigenous Legal Orders"
One of the earliest cases involving a conflict of law was Connolly v. Woolrich,  Q.J. No. 1. Connolly v. Woolrich was big. Arguably, all modern day cases involving Indigenous rights were premised on this case. In the centre of the case was the existence of an independent indigenous legal system that existed congruently with both the common and civil law traditions in Canada. The question was, what authority did that Indigenous legal order have? Connolly v. Woolrich involved a question about the legality of a marriage between a man employed by the Hudson Bay and an indigenous woman. 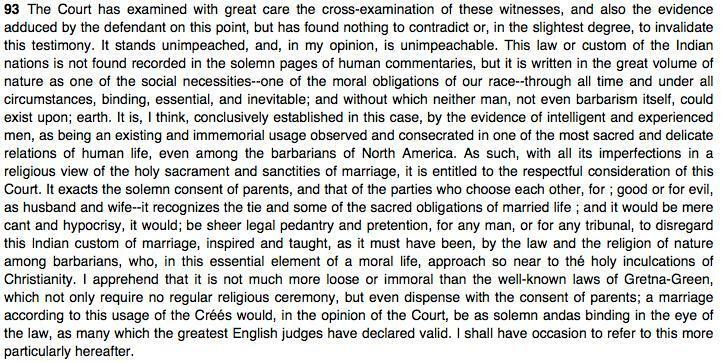 The wedding was not performed by a priest, rather, in accordance with indigenous traditions. The progeny of this relationship later made claim to the man’s estate upon his death; however, the man had married once again in a recognized institution upon his retirement. His widow claimed the previous marriage was invalid and the son was entitled to nothing. Monk J. disagreed. He reasoned that we must not abrogate indigenous traditions in favour of our own without good reason, rather, that its consideration alongside our own legal traditions is warranted. Ultimately, Monk J. went on the record to say that indigenous rights and customs mattered, to some degree, as much as those of the European settlers.